....Meanwhile Mohammed Al-Guerbouzi, a British of Moroccan origin, who was given asylum in Britain and named in British media as a suspect in Thursday's London bombings told Aljazeera TV that he is innocent and is not on the run. Three British nationals were detained as they arrived to London on flights from abroad, reported ITV news. Scotland Yard Deputy Assistant Commissioner Brian Paddick, told a news conference that the detentions are part of a separate investigation and the men, who arrived together, are not suspected of being involved in any planned second strike in the UK. Earlier, Britain's former top Metropolitan Police chief Sir John Stevens warned the London bombers were "almost certainly" British and that there were many more born and bred in the UK who are willing to attack. "We believe that up to 3,000 British born or British-based people have passed through Osama bin Laden's training camps over the years," he said. Lord Stevens added that Thursday's bombers were "totally aware of British life and values" and that it was "wishful thinking" to suspect the perpetrators came from abroad. "I am not hiding and I am not a terrorist," Muhammad al-Guerbouzi told Aljazeera on Saturday in London. "These are all lies. They have made up this story," al-Guerbouzi added. He accused someone at the Moroccan embassy in London whom he refused to name of being behind the allegations that he had links to groups described as terrorist. In the al-Jazeera footage al- Guerbouzi is heard speaking while his bearded face is barely visible through a celluloid shadow the television network used to shield his face. The British tabloid The Daily Mail appeared yesterday with a front-page banner headline: "Is Moroccan mastermind of the plot?" London media reported that the request for details on the 45-year-old father of six, who has a British passport after being granted asylum in the mid-1990s, was sent by British police to European counterparts shortly after the three rush-hour Underground explosions and one bus bomb on Thursday. He is already wanted for questioning in connection with the Casablanca and Madrid terror attacks, which investigators say have striking similarities to the London attacks. Al-Guerbouzi was convicted in absentia in Morocco in 2003 and sentenced to 20 years in prison in connection with the May 16 Casablanca bombings that killed 45 people. He is alleged to have chaired a terror summit in Istanbul in 2003 to finalize plans for the Casablanca attacks. The Moroccan authorities claim that al-Guerbouzi, alias Abu Issa, handed over £45,000 in cash to couriers from the Casablanca bombers. In March 2004, Spanish detectives investigating the bombing of commuter trains, said that Moroccan Jamal Zougam, 31, one of the suspects of the Madrid Blasts, made telephone calls to al-Guerbouzi fixed and mobile phone lines in London. Investigators also claimed that al-Guerbouzi disappeared shortly after he was phoned by the Madrid cell. French and German security services are accusing him of connections with Abu Musab al-Zarqawi, the Jordanian-born leader of the insurgent group in Iraq connected to al-Qaida who has killed foreign hostages in Iraq and orchestrated attacks on US-led forces. Al-Guerbouzi has strongly denied this and any links to terrorism. Al-Guerbouzi left Morocco with his family in 1974 at the age of 17 to settle down in London. He had been living in Kilburn, North West London, as a student of the militant cleric Abu Qatada. The cleric is among foreign terror suspects freed from prison recently who are tagged and kept under curfew at home. Al-Guerbouzi was given British nationality in 1994. 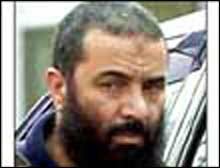 Intelligence chiefs allege that he set up a branch of the Moroccan Islamic Combatant Group in London in 2002. But Guerbouzi has denied this. The London-based Asharq al-Awsat reported that al-Guerbouzi was close to a group that used to send Muslim volunteers to Bosnia to fight the Serbs during the Yugoslavia civil war and to Chechnya to fight the Russians. The paper also quoted him as saying in an old interview that he opposed "suicide bombings". The same paper quoted AFP as saying Mohammed Darif, a Moroccan political analysts and expert in Islamist groups has cast doubt over al-Guerbouzi's involvement in London blasts. “I don't think al-Guerbouzi is linked to London blasts, because he was watched by the British police, and was wanted for Casablanca and Madrid attacks. Al Qaida normally deals with people who have no criminal records,” Darif told AFP. Spanish investigators, composed of two teams, who led the probe into the Moroccan bombers that left 191 dead in the Madrid attacks are due to arrive in London to help British police in the inquiry into England's worst terrorist attack. One specializes in Islamic extremism and the links between suspects in Spain and Britain. They are set to arrive in Britain on Sunday. A second team, experts in the explosives used by al-Qaeda, will follow in a few days.